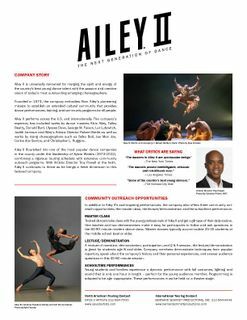 Please Credit Photo: Ailey II in Alvin Ailey's Revelations. Photo by Eduardo Patino. Choreographer: Alvin Ailey. Alvin Ailey said that one of America’s richest treasures was the cultural heritage of the African-American —"sometimes sorrowful, sometimes jubilant, but... always hopeful." This enduring classic is a tribute to that heritage and to Ailey’s genius. Using African-American religious music--spirituals, song-sermons, gospel songs and holy blues--this suite fervently explores the places of deepest grief and holiest joy in the soul. "Is there a more moving work in 20th century dance than Revelations? 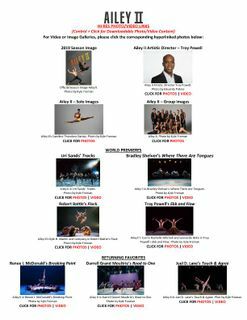 Ailey II, the junior company of Alvin Ailey American Dance Theater will perform Alvin Ailey's 'Revelations' at Celebrate Brooklyn! on Saturday, August 6. This special evening honors the 50th anniversary of 'Revelations', which is considered one of the timeless masterpieces of American dance.